In this installment of #MadeInFrame, we spoke to Conan’s lead editor, Robert James Ashe, about the extreme challenge of making the Haiti show on a one-week editorial schedule. We asked Rob to smile for the picture. He said his face won’t let him. Because our news cycle seems to operate on a turbo-charged schedule nowadays, getting this episode aired while Trump’s comment was fresh in people’s minds was important to Conan. First, a full-length travel episode (usually 42 minutes) has a typical editorial schedule of somewhere between three weeks and three months. Second, the shoot was set for four days in Haiti, meaning that the editorial staff (who work in Los Angeles) wouldn’t even have the first footage in hand until seven days prior to air. Third, they usually shoot somewhere in the neighborhood of 20 hours of footage for the travel shows. That’s a 28:1 shooting ratio. Fourth, during the week leading up to the special, they were still taping regular nightly shows in addition to editing the travel show—and the three staff editors stay quite busy doing “only” that. Beyond that, there were promos to be cut, material that had to go to the Team Coco social media outlets, and all the tasks associated with finishing: color correction, graphics and effects, translations, and audio sweetening. Needless to say, if anything went wrong, a common occurrence on remote shoots in unfamiliar places, there would be little time to recover. The best laid plans of mice and men oft go awry, wrote the Scottish poet Robert Burns—and that was almost two hundred years before live television was even invented. He had no idea. It’s almost irrelevant to talk about planning ahead on such a compressed schedule. On the production side, Conan enlisted the help of Anderson Cooper, who’d been to Haiti, and he helped connect Conan and the producers with his contacts. They used Sony PDW-F800s going to Odyssey recorders for the A and B cameras, and incorporated additional footage shot with GoPros and iPhones (which were necessary for the sequences that were done in tight quarters). Rob explained that, usually, the remote episodes are shot at 24p because it gives the footage a more filmic look, even though “Conan” plays for a live audience at 1080i 29.97. In the case of the Haiti show, however, they decided to shoot everything at 29.97 because there was no time in the schedule for frame-rate conversions and the resulting headaches. 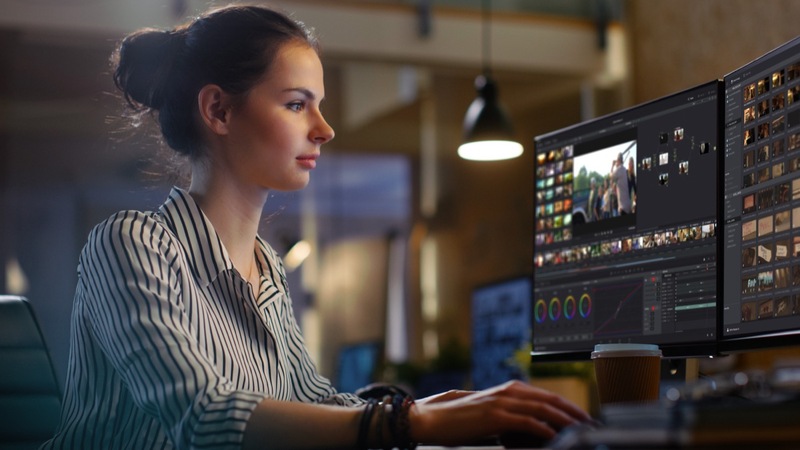 It’s certainly possible to do a proper frame-rate conversion from 24 to 29.97 without a perceptible loss of quality, but it can be tricky, especially when the production team is mixing several different formats, and it always adds at least a small delay. On this project, every minute counted. Team Coco editors Matt Shaw and Chris Heller are checking to see if Rob is sleeping with his eyes open. As usual, the Team Coco crew was there, shooting concurrently, and whatever they grabbed was used, as well. In case you’re not versed in the origin story behind the name “Team Coco,” it’s a name that started during “The Tonight Show” days, when fans took sides in the Jay vs. Conan debate. The new “Conan” show has a huge presence on a number of social media platforms with a large and loyal following. Based on what they’d learned from the previous travel shows, Rob was able to make an educated pre-order of stock footage of the various locations they were visiting to use as B-roll. The editorial team also kept in close contact with the field producers and followed the Team Coco social media feeds to get a preview of where they were and what they were shooting so they could start thinking about the segments in advance. Chris Heller pretending to be on the phone. On Friday, the runner who had the footage landed in LA, which meant that the editors had the weekend to make as much progress as they could before the first weekday show taped. Rob manned the Friday night shift to ingest all the material to Premiere Pro, make sure it all synced, and to organize it. He parceled out the segments to the other two editors, who were going to take the day shifts, and transmitted footage to the TBS promotions department in Atlanta so they could cut the promo pieces there. While it is undoubtedly true that the team’s round-the-clock work ethic was key to the show’s delivery, excellent organizational protocol was also a huge factor. Editor Matt Shaw working diligently around the clock. So, for example, the sound effects master folder would be numbered 400. Subfolders within that would be numbered according to the sequence (401 for cooking school; 402 for factory, etc.). This strategy of keeping the file structure a mirror of the bin structure allowed the team to simplify one element of a very crazy process. They also have a number of coordinators on the show who communicate back and forth between the editors, writers, producers, and the graphics department so that the editors can stay focused. “They’re amazing. And they like to keep us in our chairs,” Rob says. Heller pretending to use the intercom. By the end of that first weekend (three night shifts of Rob’s time plus two-day shifts each for the other two editors), the fifteen hours of footage had been trimmed down to a more manageable eleven hours. But that’s also when the regular nightly shows kicked back into production. While one editor dealt with the talk shows, the other two focused on the travel show. That means that one person was responsible for taking on the work of three people for that week. Rob secretly realizing he just spilled food on Heller’s desk. It’s not what you’d call a luxurious schedule even with three editors. But editors who do broadcast work know all about tight deadlines. As the days ticked by, the show was whittled down: from eleven hours to six, to four hours—with four days until air. Jimmy Vivino, the bandleader, was working on the music, and the opening “History of Haiti” piece, a text-intensive and animation-intensive behemoth, designed by the graphics “geniuses” (as Rob refers to them) and brought to life by Chris Heller. Sure, they had a crazy schedule. And absolutely, there were logistical challenges. But that’s all on top of the inherent challenges of cutting comedy—especially when you’re dealing with language barriers and unpredictable situations. Noting that the editorial process on the show is a completely collaborative effort, Rob defers to his colleagues, Matt Shaw and Chris Heller, to explain how they approach the task creatively. “With Conan’s travel shows, nothing is set up or rehearsed,” Chris says. “It’s all about finding moments where Conan really connects with people.” It’s also another reason why going through all the footage is especially important. For example, on the first day of shooting, Conan finds himself in a crowd of people who are wary of his presence because they think that Americans only come to Haiti to show their country in a bad light. In his signature self-deprecating style, Conan not only manages to convince the crowd that he’s there to show them in their best light, he ends up getting laughs and hugs. What’s maybe the funniest part about that segment, however, is that the editor spotted a misunderstanding between Conan and his translator and ran with it. Watching the two men talking past each other and freezing on the baffled translator’s face is comedy gold. And then making sure it lands. That sounds straightforward enough, but compounded with the back and forth translation, background noise, and sound effects, you realize how much effort goes into making unscripted moments coalesce into an enjoyable comedy experience for both the live and TV audience. Under such extraordinary conditions, it’s a testament to the incredible teamwork of the “Conan” crew that the final show is illuminating, hilarious, and uplifting. From suspicious crowds to delighted school children who can’t get enough of Conan’s clowning, it’s a 42-minute distillation of the four days he spent in Haiti that brings a far more nuanced and balanced vision of the island nation to America than we get from watching the news. After all, nothing brings people together better than a shared laugh. Because one man’s s***hole may be another’s beloved home. You can watch the full segment, plus some Q&A and additional Haiti trip videos at http://teamcoco.com/haiti/.